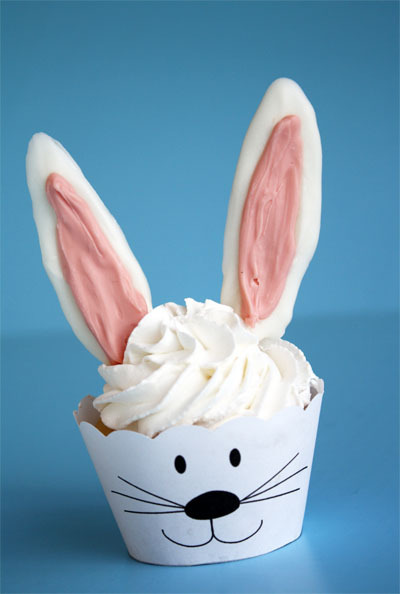 How about some bunny cupcakes with candy ears? All you do is print off the bunny cupcake wrapper, cut it out and fasten with glue stick. I used the same technique as I did for the Easter basket Cupcake. This time I used almond bark from the grocery store and a few pink colored candy coating discs. The ears would also be cute made with sugar cookies! I am linking up to these fabulous blogs! I love this - so cute. Unbelievably cute! Can't wait to try these for myself. So simple and so adorable:) Thanks for sharing! Simple and cute...thanks for sharing the printable wrappers. I had to pin it to Pinterest...too cute not to share! Have a super day. Ooops! I meant "hop to my Lou!" Very "hope to my Lou!" I sent this to my sis to use for her Walk for the Cure Bake Sale -- thanks! I love these! 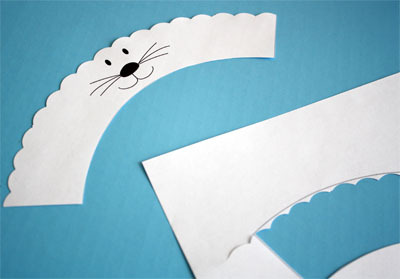 What scissors (make and design) do you use for your scalloped edge? 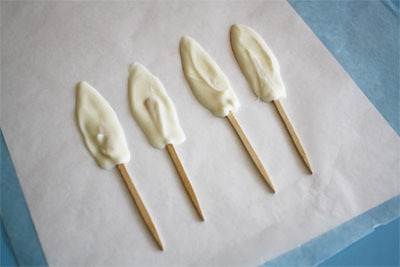 I'm making these today for our egg dyeing party. I used marshmallow fondant for the ears, I had it on hand. Very cute, thank you! These put a smile on my face!!! :) So creative. What a fun idea! As always you are the greatest at coming up with ideas for special occasions. Thanks for sharing. Those are so cute! I love this idea. Thanks so much for sharing, I'll be linking. This are the cutest! What a great idea! They're fab - sooo cute! I must lay my hands on some candy coating soon, I haven't found any in Kent! Such a cute idea! Is there no end to your creativity?! Thanks for sharing. Those a super cute! Thanks for the download! Love how you made the ears. I used marshmallows and didn't really like the outcome. These are just the cutest! I think it would be so easy to make, and would be a project that you could include younger children! aww, adorable!! i'm gonna make these with my little girl, she's gonna love it!